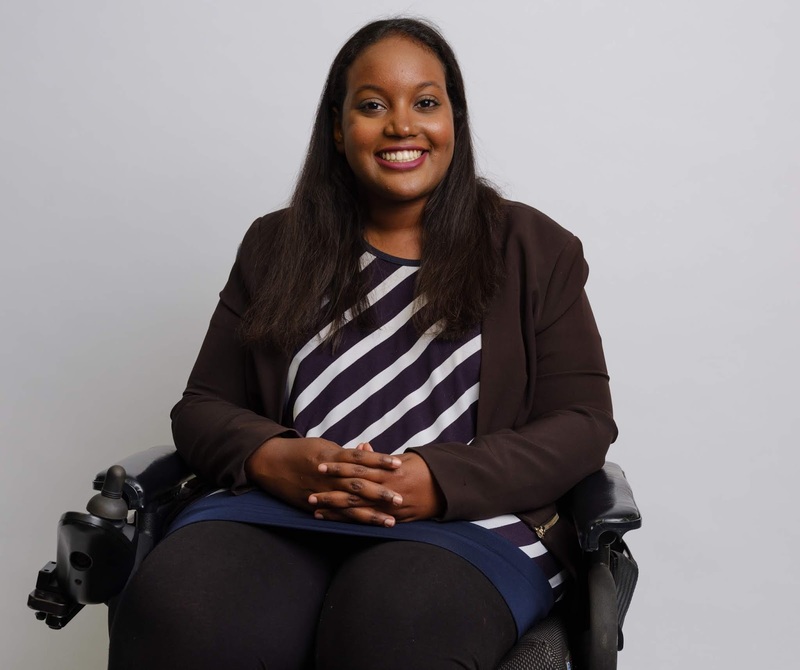 Sarah Jama is a co-founder of the Disability Justice Network of Ontario. She has a long history of disability rights and anti-racism activism. While studying at McMaster University, Sarah headed the National Educational Association of Disabled Students for a two-year term. She also founded Maccess—the first peer-run service for students with disabilities at McMaster. This Wednesday Feb. 6, Sarah is speaking on Moving Toward A Disability Justice Revolution at Hart House at the University of Toronto. I learned a lot about her work through this video of a talk she gave last year called We All Deserve the Right to Life. BLOOM: In your video, you talk about how you learned at age four that as a black, disabled girl, you didn’t have the same right to bodily autonomy as others. This happened here, at what was then the Hugh MacMillan Rehab Centre, when you came for your first physiotherapy appointment. Sarah Jama: I was saying ‘No, I don’t want to do this,’ and they started to stretch my leg and my mom was freaking out, because she didn’t understand why it was painful. They asked her to leave the room, in order for the physio to continue, and she watched behind a two-way mirror, because she didn't want to get a coffee as they suggested. When I talk about navigating the medical system with an immigrant family, a lot of times, without meaning to, people in medical positions play the role of the expert: ‘We know what’s best, therefore these things over time will be the best for your daughter.’ When the parent, or the person, isn’t seen to be the expert, there’s a lack of communication. BLOOM: You said you and your mother were both in tears. Another time, when you were a teen, doctors wanted you to have a surgery. You didn’t want to have it, because it would mean you wouldn’t graduate on time with your peers. You had also had the same surgery at age 12, and it didn’t give you the result you expected. Sarah Jama: The surgery, from my perspective, was an aesthetic one. It didn’t work the way I thought it would when I was 12. And it took four months for me to be fully rehabilitated. The surgeon looked at my mom like she was absurd in supporting me in my right to say no. I talk about how these kinds of interactions, over time, can influence someone’s perception of bodily autonomy—that it means not having a say over certain areas of your life. Some people are viewed as experts over racialized bodies, which is dangerous when coupled with a lack of cultural competency. An example is the criminalization of black and indigenous folks with invisible disabilities. Soliman Faqiri and Abdirahman Abdi and so many others with autism or schizophrenia have been killed by those meant to serve and protect, because being a person of colour, while having invisible disabilities, gets you perceived as being violent. Our education system fails people with disabilities. In high school, I was given a spare in place of physical education. The school, at the time, didn’t have proper supports to support me in physical education. But that meant that I missed a lot of the sexual health education that’s taught. We know from Statistics Canada that 82 per cent of women with disabilities will be assaulted once in their life in Canada. Sexual violence and education aren't linked at all, but we're missing key information on how to protect ourselves. The more I talk about how I missed out on that education, other people with disabilities tell me that they missed it, too. When I’m talking about disability justice as a means to tackle forms of oppression, I’m coming at it from an intersectional perspective. The leadership, the people in positions of power, don’t reflect the disability community itself. Within that, I’m calling attention to the whiteness of the structures that prevent people with disabilities from diverse backgrounds from being able to participate in all facets of education and health care, or result in them being perceived as violent. BLOOM: You are the founder of the Disability Justice Network of Ontario. What is the purpose of that network? Sarah Jama: Our vision is to create a world where people with disabilities are free to be. Our mission is to build a just and accessible Ontario where people with disabilities have personal and political agency, can thrive and foster community, and can build the power, capacity and skills needed to hold people, communities and institutions responsible for the spaces that they create. BLOOM: What needs to change? Sarah Jama: The problems are structural. The conversations around accessibility today are stuck in the ‘90s. We talk about people needing access so we can expend our economic purchasing power. There aren’t enough conversations around how people with disabilities who move through our education, medical and prison systems have a right to equity in these spaces, and how racialized people with disabilities navigate these spaces differently. Another structural change that needs to occur is in our provincial and federal budgeting. A lot of funding goes towards children with disabilities. That funding becomes minuscule in adulthood. It’s as though people with disabilities don’t exist in our adulthood—we disappear. The lack of education created for people with disabilities needs to be addressed. How are we training young people in the history of disability justice? Where do you learn this? I had to do a lot of self-learning about how disability rights came to be. Systemically, I was taught that when you have a problem, there are systems in place to support you. For example, if you have a problem in school, you go to 'student accessibility services.' But what do you do when that system doesn’t work for you? The conversation around justice and rights is not happening in our education system. The important thing for young people with disabilities to know is that you don't have to resign yourself to using the structures in place. We're the largest minority in the world: we fit every religion, race and geographical location. Someone with a disability who experiences structural issues should understand that not being able to navigate spaces easily is tied to root causes. People with disabilities don’t fit the common understanding of productivity, so we are least likely to have a system in place that fits us, especially if we’re seen as not being able to contribute back. I was able to push my university to allocate $30,000 to fix elevators that were broken. I also created Maccess, which is an organization run by students with disabilities for students with disabilities. At Maccess, students taught self-advocacy skills and had peer supports in place. BLOOM: Something I valued in your video was that you talked about the rights of people with all kinds of disabilities—including people with intellectual disabilities and mental illness. I often see people with one type of disability distancing themselves from people with other types. Sarah Jama: I think it has a lot to do with funding levels. Autism Ontario is funded one way, the Ontario Federation for Cerebral Palsy is funded another, and all of these groups end up competing for support, fracturing community instead of building it. Disability organizations aren't built to be part of a greater community that collaborates. The way to combat that, 100 per cent, is for everyone to come together and acknowledge that we're part of a larger community that historically has been left out of many parts of society. We're also part of an ever-growing community. One of the leading causes of disability is old age, so everyone at some point will experience it. The sooner we come together to build a community that fits all people with disabilities, the sooner we’ll have a world that fits everyone. BLOOM: You talk about how people in our culture confuse the rights of people with disabilities with their value to the economy. Sarah Jama: I think that’s a faulty and harmful argument. So many people with disabilities can’t work, and do they have the right to exist then, if they can’t contribute? It’s similar to the way seniors are treated. Once they age out of the workforce, they're seen of as disposable. We see conversations in the public media now about the right to assisted suicide. What about the rights to supports during life? Why does more funding go toward prenatal screening of Down syndrome—and I’m pro-choice—but not toward supports for adults with Down syndrome? The issue lies with institutions pre-deciding where someone can access support. Who really deserves life, and who has the right to exist? You have to earn your value, or you’re a burden on society. Couple that with youth with disabilities not knowing about their rights, or that there’s a community of people who have fought for their rights, and by the time they turn 18, depending on their capacity, they struggle with self-esteem, with having community and with understanding their worth. They don’t know that it’s their right to have help and support. BLOOM: I liked the way you question our culture’s obsession with independence. Sarah Jama: We’re obsessed with the idea that you’re worth more if you don’t need anybody. It’s a strange cultural phenomenon that doesn’t make sense. No one is truly independent from anyone else. Mia Mingus has written a lot about interdependency, and how we should be able to go to our communities and find supports, and not see it as a loss of autonomy, but moving toward a larger collective of potential. For example, nobody tends to be able to survive without going to a grocery store. But that food comes from a farmer. You didn’t package that food and put it in the grocery store. You’re dependent on the structures that are in place, and the community that puts that grocery store in place. We need to teach kids that we all sort of rely on each other, and that’s okay. BLOOM: I noticed you're working with the Hamilton Wentworth District School Board to create curriculum to address anti-black racism. Is this something we need to work on with staff and families in children’s rehab? Sarah Jama: Yes, I think so. I’ve created a black youth mentorship program for 40 black youth that meets monthly at Sir John A MacDonald Secondary School in Hamilton to talk about their worth and the way to navigate society and the supports in place for them. On Feb. 12 we have Robyn Maynard coming to speak with them. She wrote Policing Black Lives, which is an acclaimed book on the history of policing in Canada. We also have Sandy Hudson coming, who is one of the founders of Black Lives Matter in Canada. On Feb. 25, the same youth will be meeting with black elected officials at Queen’s Park to talk about being black and navigating politics. BLOOM: What advice would you give parents raising kids with a wide variety of disabilities? Sarah Jama: As much as possible, have conversations around the history of disability in Canada, and how we got to a point where we have a federal piece of legislation. Who are the movers and shakers in our communities? What provincial legislation do we have? What communities have pushed for the rights of people with disabilities to exist equally and freely? It’s important for kids to grow up knowing that there’s a community, because a lot of us internalize our experiences.